The native name in Torres Straits is Nar. The figure was secured by Dr. Haddon, who has given me his unpublished description of it. 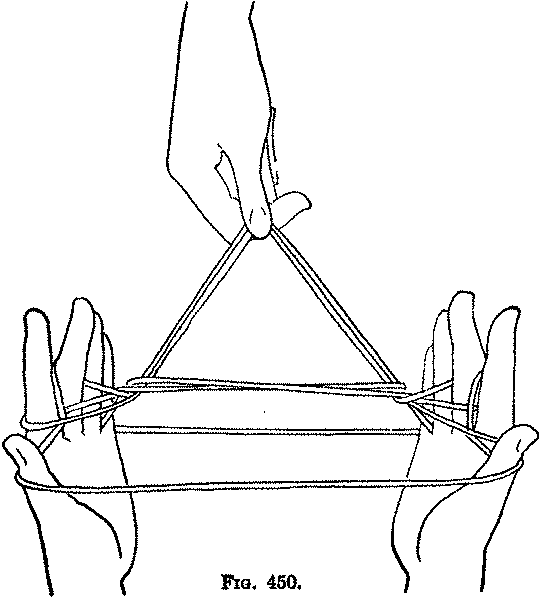 Second: A second person passes his hand toward you over the far little finger string and under the crossed far index strings, and picking up the two near index strings where they cross (Fig. 446), pulls them away from you through the figure (Fig. 447). 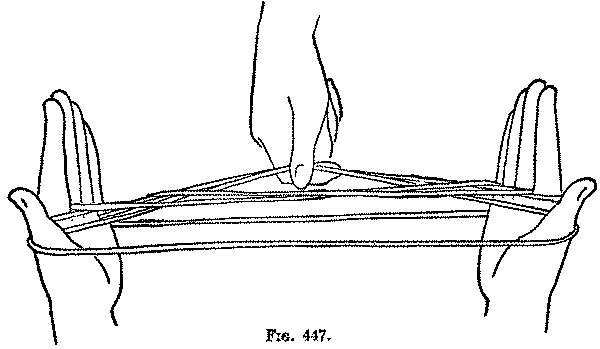 Third: Bend the right middle finger and pass it from above through the right ring-like index loop (Fig 448). Then, with the left thumb and index, pull the right near index string to the left, so that you can pick up from below on the back of the right middle finger the right far thumb string (Fig. 449). 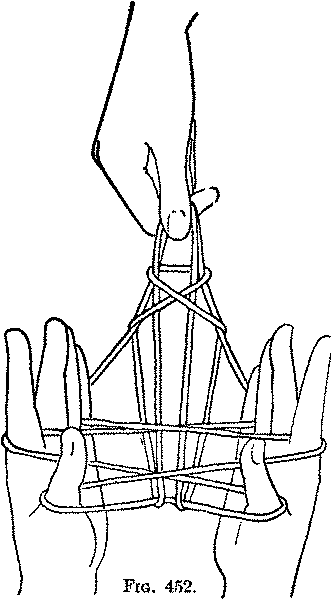 Return the middle finger to its position and drop the string held by the left thumb and index. In the same manner, bend the left middle finger and pass it from above through the left ring-like index loop. 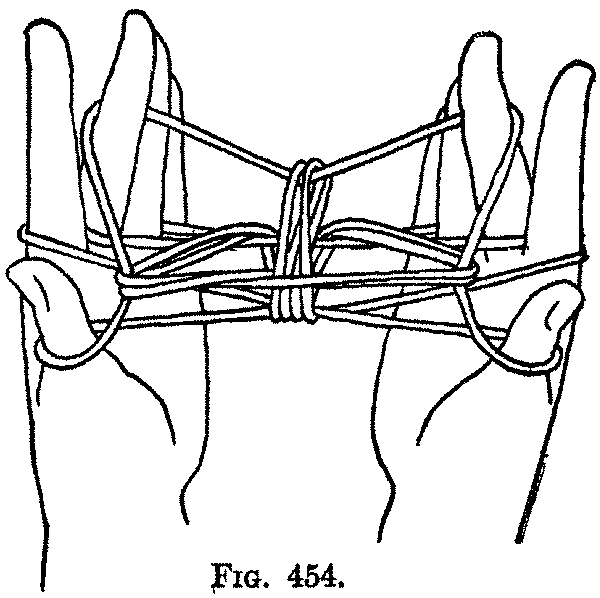 Then with the right thumb and index pull the left near index string to the right, and pick up from below on the back of the left middle finger the left far thumb string; return the middle finger to its position and drop the string held by the right thumb and index (Fig. 450). Fourth: Release the loops from the little fingers, the index fingers and the thumbs. 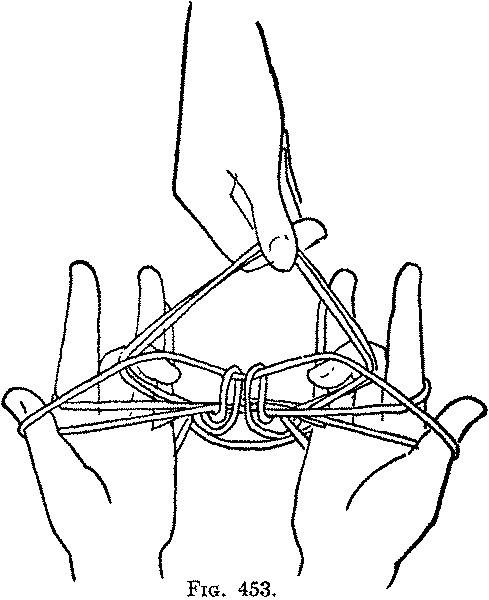 Arrange each middle finger loop on the hand in the "First Position" (Fig. 451). The second person must not release the loops he has been holding. Fifth: Form Opening A (Fig. 452). 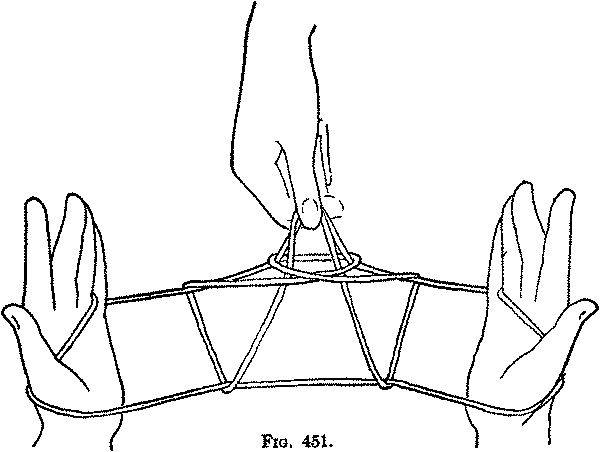 Sixth: Pass both middle fingers from below into the loops held by the second person, and bending them toward you pick up from below on their backs the near thumb string (Fig. 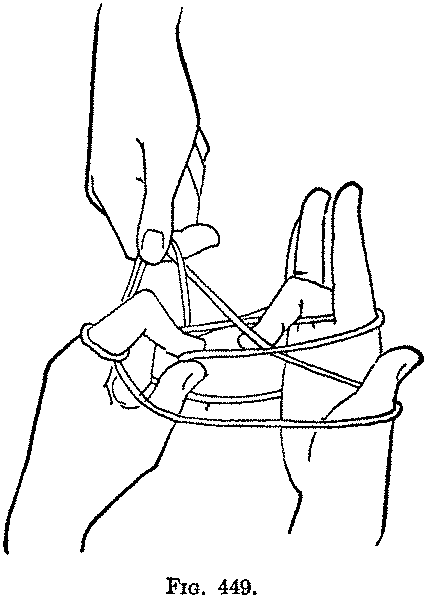 453); then, by straightening the middle fingers, draw this string away from you and down through the loops held by the second person. 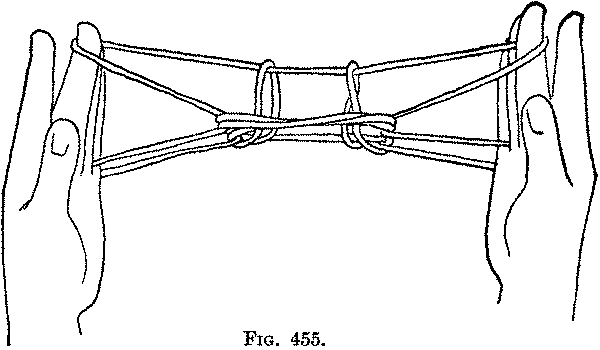 Seventh: The second person now releases the loops he has been holding (Fig. 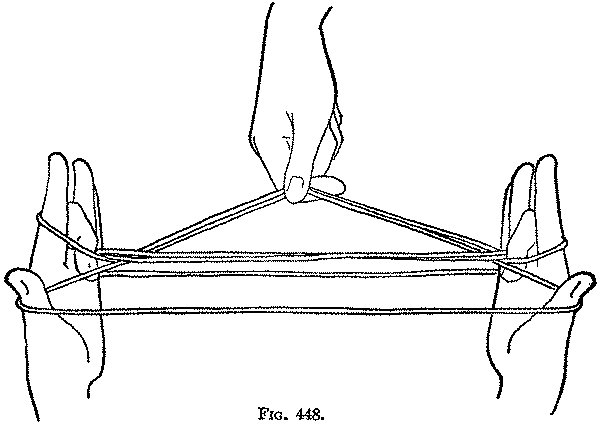 454) and you release the loops from the thumbs and index fingers, and draw the strings tight to extend the figure (Fig. 455). In forming this figure a native would not require the aid of a second person, but would use the toe to draw down the crossed near index strings, in the Second movement. To prepare for this it is necessary after Opening A to turn the hands with the thumbs up and the fingers pointing away from the body.